Shooting grade is the process of testing the elevation of a construction project in order to level or slope it. Shooting grade properly is critical to every facet of construction including excavation, pipe laying and forming footers and foundations. The importance of shooting grade and leveling or sloping the ground in accordance to the plans can not be overstated. It affects a project from the ground up. As important as it is, shooting grade is simple. 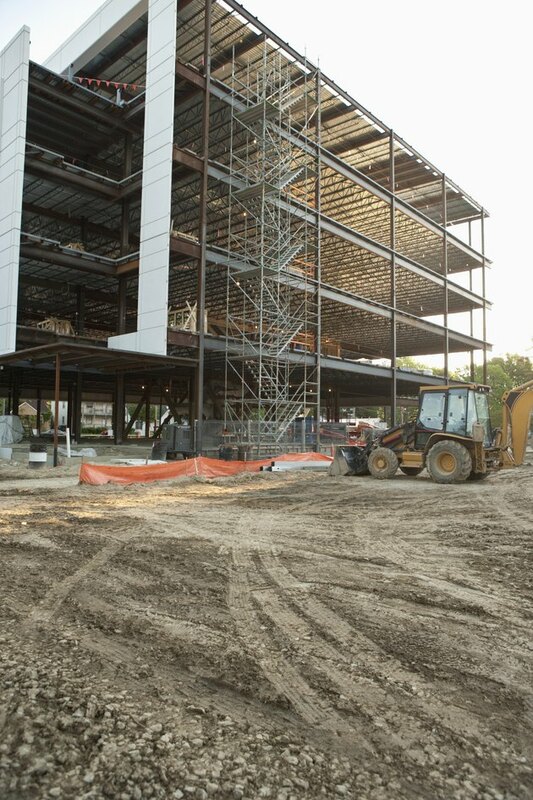 Without shooting grade and leveling a jobsite prior to construction, a building will lean. Set up the tripod of the laser level or transit; spread the three legs, each an equal distance from the other two. Put the laser level or transit on top of the tripod. Level the base of the tripod using the three bubble levels as indicators. Adjust the knobs on the base, in conjunction with one another, until all three bubbles are within the marks indicating level. Position you partner within the building site or in the pipe trench. Direct her to raise or lower the receiver on the grade rod. When the receiver is at elevation with the laser level's eye, it delivers a constant beep. If the receiver is too high or low on the grade rod, the beep is broken with intervals of silence. For a transit, simply read the elevation on the rod through the transit and record the value. Set the grade rod at different locations on the site. Record whether the ground, concrete forms or trench are above or below the original reading. Inconsistencies in grade require further excavation. Consistency is typically within 1/24 of a foot, or half an inch. Trenches for gravity fed lines have a constant fall, at least 1/8 inch per foot. Use the grade rod to test the fall. Ryan Hotchkiss began writing professionally for a local newspaper while in college. He graduated with a bachelor's degree in English composition, then worked for five years at an online education company. Hotchkiss continued his writing career composing bid proposals for an architecture firm until moving to Costa Rica.